Riordan, Rick. (2008). The maze of bones. New York, NY: Scholastic. The Maze of Bones (The 39 Clues, Book 1) by Rick Riordan is an adventurous spy thriller, historically educational, instantly engaging, and even an online game. The Maze of Bones is a fun adventure story that revolves around a historical scavenger hunt of the life of Benjamin Franklin. 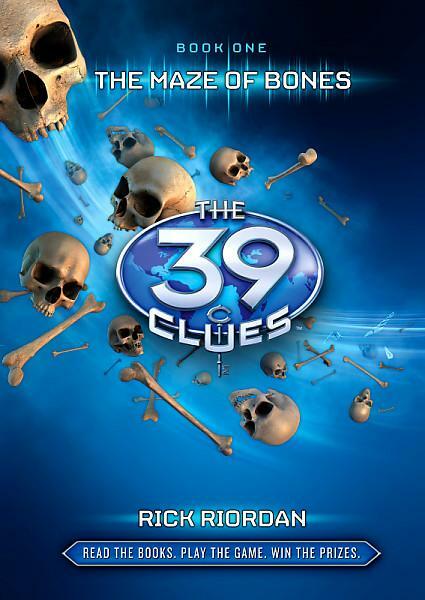 The 39 Clues book series offers much additional content to allow the reader to feel as if they are a part of the Cahill adventure. Yes, this fun adventure story also offers a game option (www.the39clues.com). Collector cards come with each book in which the reader can register at the 39 Clues website, discover they are a missing member of the Cahill family, and travel deeper into the world of these books. The more you read, the more cards you collect and the greater the clues one will discover. Orphaned siblings, Amy (14 years old) and Dan (11 years old) Cahill are members of the world’s most powerful family. Some historical members of the Cahill family include Houdini, Napoleon, Benjamin Franklin, and Mozart. The matriarch of the family, Grace Cahill, their grandmother, died immediately after changing her will. Grace’s new will offers her descendants the option to solve the family mystery while experiencing an adventure of a lifetime based off of 39 clues or settle for $1,000,000. The siblings, Amy and Dan feel as if their grandmother wanted them to participate. As Amy and Dan were viewed as Grace’s favorite grandchildren, obviously, most believe they been given prior knowledge about the clues. But, like everyone else, these two are as clueless as the other members of the family. Teams are formed, alliances are made, betrayal lurks around every corner, and new discoveries about Amy and Dan’s parents and what actually happened to them are as much a mystery as hunting down the location of the next clue. The first clue in The 39 Clues book series revolves around the life and inventions of Benjamin Franklin, another member of the Cahill family. Brilliant Amy solves the clue as she recalls Richard S. as Franklin’s pen name for his the farmer’s guide Poor Richard’s Almanac. As Amy and Dan travel from New York to Paris and finally to the Paris Catacombs (hence the title of book one), they are in a fight for their lives against many unlikable members of the Cahill family as they solve the mysteries that surround each clue. Amy and Dan escape a fire, a bomb, being buried alive, an angry mob, potential poison, physical harm, and many more unexpected disasters all at the hands of their aunts, uncles, and cousins. The Maze of Bones will leave any reader desperate for more questions, drama, adventure, mystery, and historical fiction. As the second clue is discovered at the end of book one, the reader can assume the next adventure will focus on the life of Wolfgang Amadeus Mozart in One False Note (The 39 Clues, Book 2). And, most readers will quickly find themselves hooked and eager to read more of The 39 Clues books. Readers may also like Rick Riordan’s newer series; The Kane Chronicles (The Red Pyramid, The Throne of Fire, and The Serpent’s Shadow) that also follows an orphaned character raised by a grandparent, travels the world, and discovers many mysteries of ancient civilizations.